A fairy tale…in flowers! 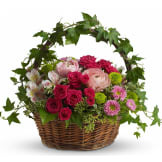 Delicate ivy climbs the handle of this round wicker basket that's home to a feminine garden of fuchsia flowers. You can almost imagine garden sprites dancing through the country style arrangement! • A round wicker basket holds an array of fresh flowers including hot pink roses, pale orange roses, pink ranunculus, pink alstroemeria, light pink matsumoto asters and green button mums. • Ivy, seeded eucalyptus and oregonia add lush greenery. 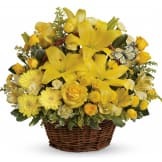 Flowers will be received by a Precious Memories Funeral Home & Cremation Services, David Taylor, P.A. 's staff. Beautiful fresh flowers and delivered on time. Thank you very much. Nice to be able to get delivery the same day over the internet. I ordered this from out of town, so I didn't actually see this product, however I was told it was beautiful. Everything was perfect. 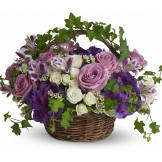 The ordering, the delivery, the timeliness and the beautiful arrangement could not have been handled any better. Your services took a weight off of my shoulders, in that you had all the information and met all of my needs and took care of everything. I would highly recommend using your services to everyone. 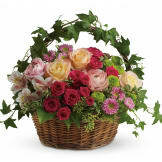 Very beautiful arrangement of roses accented with the ivy. Well done! All of our flowers are designed and delivered by hand from a local florist in in Waldorf.